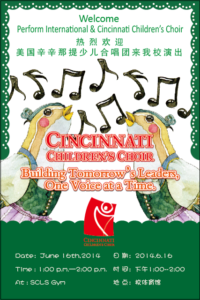 Mrs. Lana invited the members of the Cincinnati Children’s Choir Bel Canto Choir as well as parent chaperones to participate in The International Children’s Choir Festival in Beijing, China. She was honored to have been invited to co-conduct the festival choir with Yang Hongnian, conductor of the China Children’s Choir and Professor at Central Conservatory of Music, Beijing. 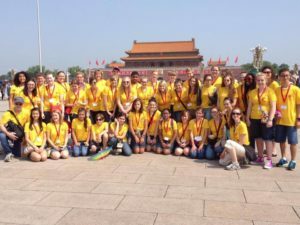 During our time in Beijing and Shanghai, singers had the opportunities to get to know the youth of China, visit their schools, share their glorious concert stages, and make new friends from choirs across the United States. After having many discussions with Perform Asia, we found that they share our cultural, artistic, and education philosophies, and we are happy to have provided this life changing experience. A concert on the Great Wall of China in Beijing. The International Children’s Choir Festival with orchestra in the Forbidden City Concert Hall and 1 additional concert in each of the other cities. Tour of Tiananmen Square and the Palace Museum in the Forbidden City. A performance by the world-famous Shanghai Acrobats in Shanghai.